Update 6/12/12: We were notified that at 4am this morning Ashley got her wings! Rest in peace Ashley. No more suffering, no more trying to catch your breath. You were a strength to so many. HELPING TO FUND LUNG TRANSPLANT! Ashley Spotts received a double lung transplant on February 14, 2010, and her insurance will pay 80% of the cost. Ashley and her family have to pay the remaining 20% which equals approximately $110,000. Pennsylvania Cystic Fibrosis, Inc. (PACFI), the Walk On Foundation, and Kingdom Kidz, Inc. have combined efforts to help Ashley and her family pay the uninsured costs. As of January 18, 2011, the three organizations have raised $34,604. People who want to donate to Ashley’s Angels Transplant Fund can make a check out to PACFI and mail it to PACFI, c/o Ashley’s Angels, P.O. Box 29, Mifflinburg, PA 17844. Less than a year ago, 20 year-old Ashley Spotts was breathlessly clinging to life and waiting for a double lung transplant.Spotts, a Sunbury native, has cystic fibrosis (CF) and diabetes, and her lungs were failing. It was late in the evening when the University of Pittsburgh Medical Center called to say that lungs were available for a transplant. Ashley’s father, Bruce, and mother, Christine, packed Ashley in the car with her oxygen and drove the five hour journey to Pittsburgh through a winter storm. “She ran out of oxygen just as we got to the emergency room,” Christine said. The transplant team, headed by Dr. Jay Bhama, was ready and the 12-hour double lung transplant surgery was successful despite the fact that Bhama had to scrape out Ashley’s severely damaged left lung and repair a hole in her heart. It was Valentine’s Day, February 14, 2010, when Ashley got her new lungs. “God saved her through Dr. Bhama’s hands,” Christine said. She smiled, glad that her daughter was pulled from the brink of death. “I felt George’s presence during the surgery,” Bruce said. He smoothed his beard and stared at the floor. The Spotts’ son, George, died due to CF in 2004, and it’s easy to see that Dad misses him. 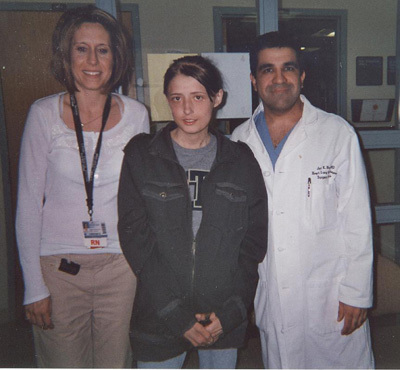 Ashley remained in Pittsburgh for follow-up care until April 24, 2010, when she was released to go home. The family had a huge ‘welcome home!’ party for her. family to pay – quite a chunk of change for a family where Mom works a regular 40 hour week and Dad is on disability from an auto accident years ago. Responding to the family’s need, Pennsylvania Cystic Fibrosis, Inc. (PACFI), the Walk On Foundation and Kingdom Kidz, Inc., formed Ashley’s Angels Transplant Fund to help the family raise funds to pay transplant costs. PACFI is an independent, nonprofit, all volunteer 501(c)(3) organization, and the other two organizations are also nonprofits. To date, they’ve raised over $34,000. You can donate to Ashley's Angels by sending a check to PACFI c/o Ashley's Angels P.O. Box 29 Mifflinburg, PA 17844.